North Carolina leaders should fund public schools adequately and address a long-lingering achievement gaps in student performance, says a panel of “Influencers” assembled by McClatchy papers The News & Observer, The Charlotte Observer and The Herald-Sun. The papers are surveying the 60-member panel on key state issues. 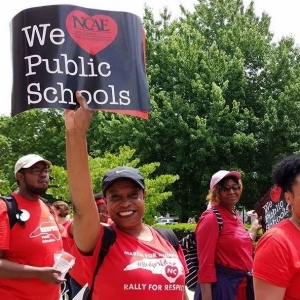 And public education has been a major talking point already this year, after more than 20,000 educators and K-12 advocates swamped Raleigh in May to protest state lawmakers’ public school policymaking. Members of the papers’ “Influencers” panel—which includes conservative and liberal pundits, business leaders, politicians and more—say public school funding is key. Nearly all the Influencers listed adequate funding as being very important, saying that taking care of that issue would help solve a variety of other problems affecting the state’s K-12 education system. “While many of these issues are very important, adequate funding is the most important,” said Pamela Davies, president of Queens University of Charlotte. “If NC was funding K-12 education appropriately, many deficiencies in our system, including teacher pay and Pre-K, could be addressed.